GREENVILLE, Miss.—Politically verboten in Mississippi for years, Medicaid expansion keeps simmering in the state Legislature because of one senator. And it could start bubbling up again if next year's governor's race breaks for Democrats. 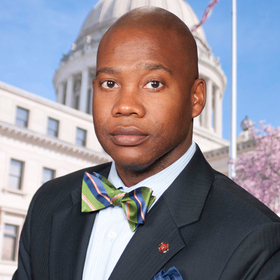 Medicaid expansion's most ardent champion in the Legislature is Democrat Derrick T. Simmons, one of three state senators representing the gerrymandered Delta districts. Simmons, a native of Greenville in the heart of the Delta, has pushed for expansion against political tides since 2013. But in those years the state has pulled in the opposite direction. And in 2018, the Division of Medicaid applied to the Trump administration for permission to add work requirements to its Medicaid population. The state already imposes some of the strictest limits in the country. Now the state government faces a potential shift as GOP Gov. Phil Bryant, a firm expansion opponent, nears the end of his term limit. Mississippi Attorney General Jim Hood, the only Democrat in statewide elected office, is polling in a dead heat with GOP Lt. Gov. Tate Reeves as a likely contender to replace Bryant. Because he has not formally announced his candidacy for the November 2019 election, Hood has not taken a stance on Medicaid expansion. However, close observers think he would likely support it. That fact, along with an April statewide poll that showed more than 52% of Mississippians support expanding Medicaid, signals that Simmons' proposal now could have a chance. The Simmons & Simmons law office sits at the heart of downtown Greenville, where Main Street meets the levee. Family Dollar and Dollar Trees stores and neighborhoods of taped-together houses lie on its outskirts, as well as elegant, pillared old homes shaded by magnolias. The Simmons brothers are trying to revive century-old buildings downtown, but some are crumbling anyway. People with desperate cases who need help or luck or both filter in throughout the day and wait on Naugahyde furniture underneath the massive framed portrait of the brothers standing as mirror images. Derrick, the state senator, wears a bow-tie; Errick, the mayor, wears a straight tie. The brothers specialize in criminal defense cases. In his public policy work, Derrick Simmons said he prioritizes two things: access to healthcare and education funding—two items that are usually at odds in state budgets. He won his state Senate seat in 2011 and as soon as Obamacare passed in Congress, he set his sights on Medicaid expansion and drafted a bill. Rep. Stephen Holland, a Democratic, said the state Legislature opposes expansion because lawmakers don't understand how Medicaid works. Simmons attributes the opposition to something deeper. He noted that expansion opponents argue that they don't want to take money and mandates from the federal government. One big reason, lawmakers and close observers of the Legislature said, was Reeves. The lieutenant governor serves as president of the Senate and can steer legislation. He sent Simmons' bill to two GOP committee chairmen who would kill it on their panels. Laura Hipp, Reeves' spokesperson, said Reeves was opposed because the state couldn't afford its share of the cost. One of the Delta's other state senators, Republican Eugene “Buck” Clarke, chair of the Senate's appropriations committee, said Medicaid expansion “is not even being talked about” in the Legislature now. He, for one, is focused on some prosperity in the Delta which he said lifts some of the pressure off Medicaid. “I'm really looking at the historic low unemployment numbers and the effect on Medicaid numbers, and we're all kind of excited,” Clarke said. Unemployment in the Delta has steadily fallen over the past five years, although at 6.8% it is still more than a percentage higher than the statewide rate. Clarke directs his Medicaid efforts to pilot programs, like a project by the not-for-profit Delta Health Alliance to curb pre-term births and diabetes among Medicaid enrollees. “With the pilot programs and we're in uncharted territory with this many people working in the state—I hate to sound like I'm salivating over new revenue coming in—but it's encouraging,” Clarke said. Roy Mitchell is executive director of the Mississippi Health Advocacy Program in Jackson which helps people who don't qualify for Medicaid or who are otherwise falling through the cracks to get care. He called the idea that people can afford health coverage once they start working a myth because few employers offer it, particularly in the Delta. In the long shot chance that the state sees a political turnover in the near future, it's unclear how the healthcare industry—poised to reap financial gain from expansion—will respond. An early lobbying effort by hospitals resulted in a shakeup of the state hospital association, according to several observers of Mississippi politics, and hospital executives don't want to talk about it. Mitchell said the hospitals' unwillingness to take a stance has sunk them in the public's approval.